Bird feeder poles that block squirrels make Squirrel Proof Bird Feeders. Squirrel Proof poles have pole squirrel baffles below to block squirrels from climbing the pole. A complete system can include bird feeder poles, bird feeders, and squirrel baffles. These 1 inch diamter poles have 60 thousands wall thickness and are the strongest in the industry. The lead time prior to shipping these pole systems is within 1 week. Add two 16 inch wrap around bird feeder hanger arms to your 1" dia. bird feeder poles. Includes Glass dish with twist arm. Place the hanger arms anywhere you like with a wrap and twist. Bird Feeder Pole 5 ft Section for 1 in. diameter poles. This pole section has .060" thick walls which are very strong. The actual section is 60 in. long and does not have any tapered ends, a flange, or any other pole parts included. Bird Feeder Pole with two hanger arms is a versatile pole ready to hang Hummingbird feeders, thistle bird feeders, hanging plants or use with a Pole Cylinder or Cone Squirrel Baffle of your choice. Bird Feeder Pole Extension for 1 in. diameter poles. Extends the pole height of an existing pole within its Squirrel Proof Poles category by 26" . 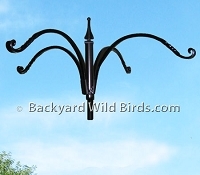 Bird Feeder Pole Quad Hanger Arm has four hanger arms. Compatible with poles within this category. The Quad arms have classy forged twists before their hook. 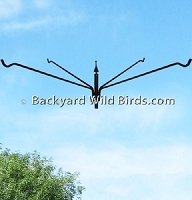 Bird Feeder Pole Quad Hanger Arm has four long 22 inch hanger arms. Compatible with poles within this category. 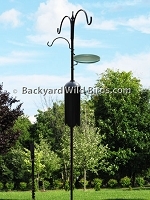 Bird Feeder Pole Top with two hanger arms. Can be use by itself or added on top of an existing double arm hanger pole within this category. Bird Feeder Pole Tree is a four long branch hanger arm bird feeder pole. Also has a squirrel cone baffle below to protect its bird feeders. 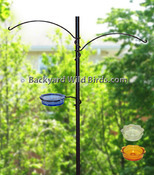 Bird Feeder Pole Trio Hanger Arm has three hanger arms. Compatible with poles within this category. The Trio hanger arms make a classy arrangement with hooks on the end. Pair of iron Branch Hanger Arms for 1 in. bird feeder pole. Great place for birds to perch close to your bird feeders. Bird Pole Ground Socket is for mounting 1 inch outside diameter bird feeder poles that slip into its 6" socket. This steel ground socket with cork screw can be turned into the ground 20 inches for a very stable platform. 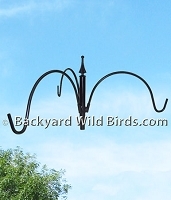 Bird Pole Twist-On Arms add two 8 inch twist-on bird feeder hanger arms to your 1" dia. bird feeder poles. Place the hanger arms anywhere you like with a wrap and twist. Cardinal Bird Feeder Pole has a bright red cardnal on top of this four adjustable long hanger arm bird feeder pole. Hanging Glass Bird feeder is a 3 inch diameter orange glass dish with metal hanger arm. 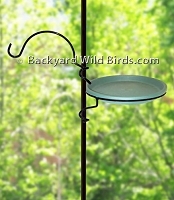 The feeder has a 12 inch hanging length. Great for expanding an existing pole system to add more bird feeders. Patio or Deck Bird Pole Base for 1 inch diameter Squirrel proof bird feeder poles. 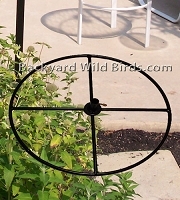 The 24 inch bird pole base is solid metal tubing with a turn screw to lock the pole in place. Bird Feeder Pole has four bird feeder hanger arms at two levels on this Squirrel Proof Bird feeder Pole system. The two bird feeder viewing levels makes an attractive pole. 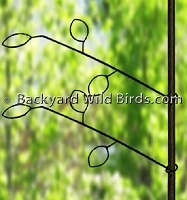 This bird feeder pole has classy swirl twists at the end of each of four bird feeder hanger arms and top pole section. Great squirrel proof bird feeder pole. Squirrel Proof Bird Pole Trio system has 3 arms ready for your bird feeders and a cylinder squirrel baffle. Bird feeder pole is a nice kit. This squirrel proof bird feeder pole adds a classy swirl twist to the end of each bird feeder hanger arm and top pole section.